When you have been seriously injured in a truck or car accident, how do you make sure you will have the money you need to make up for lost income and pay for medical care? 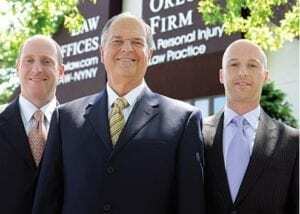 Our car accident lawyers can help. When your quality of life is diminished because of a motor vehicle accident, who can help you pursue a fair result from an insurance company that will likely be unwilling to make a fair settlement offer? The Bronx car accident lawyers of The Orlow Firm have handled car accident injury cases occurring in The Bronx for a combined 100-plus years and have the skills, legal knowledge and commitment to clients’ rights needed to effectively handle your case. Contact a Bronx car accident lawyer at The Orlow Firm at (646) 647-3398 following a car, truck, motorcycle, bus, subway, taxi, bike or pedestrian accident. Car accident legal cases almost always involve unexpected and hard-to-manage legal complexities. City-owned vehicle crashes involved different time limits for filing. Taxi companies carry different liability coverage. And accidents involving commuter cars and other “regular” vehicles can involve both the other driver’s insurance and your own underinsured and uninsured motorist coverage. We can speak with you and assess your potential claim at no charge, then provide aggressive, caring and results-driven legal help. We have handled hundreds of car accidents occurring in the Bronx and across all of New York City and through negotiations and litigation have recovered many millions of dollars in compensation for injured clients. For a no-charge consultation with a Bronx car accident lawyer, contact our office.